The underlying cause of male infertility is unknown for 30 percent of cases. In a pair of new studies, researchers at University of California San Diego School of Medicine determined that the reproductive homeobox (RHOX) family of transcription factors—regulatory proteins that activate some genes and inactivate others—drive the development of stem cells in the testes in mice. The investigators also linked RHOX gene mutations to male infertility in humans. The mouse study is published September 27 by Cell Reports and the human study was published September 15 by Human Molecular Genetics. "Infertility in general, and especially male fertility, gets little attention considering how common of a problem it is—about 15 percent of couples are affected, and nearly half of these cases are due to male infertility," said Miles Wilkinson, PhD, professor of reproductive medicine at UC San Diego School of Medicine and senior author of the Cell Reports study. "That means around 7 percent of all males of reproductive age—nearly 4 million men in the U.S.—have fertility problems." Wilkinson is also a co-author of the Human Molecular Genetics study, which was led by Jörg Gromoll, PhD, at the University of Münster in Germany. 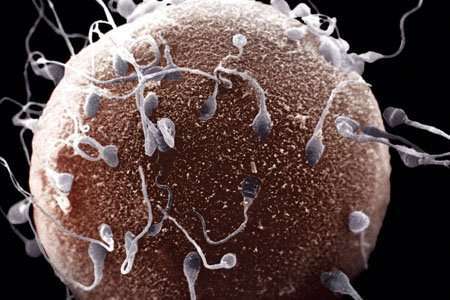 Sperm are made from cells that undergo many stages. Transcription factors have been identified that direct most of these cell stages, from the dividing cells in the embryo to the cells that rearrange and partition the chromosomes to individual "pre-sperm" in the testes. However, before this latest research, Wilkinson said no transcription factors were known to direct one of the most critical stages—the formation of the stem cells in the testes, known as spermatogonial stem cells. In the Cell Reports study, Wilkinson and team removed the entire cluster of 33 Rhox genes in mice. They were surprised to find that the most notable defect in these mice was a deficiency in spermatogonial stem cells. Hye-Won Song, PhD, assistant project scientist in Wilkinson's lab and first author of the Cell Reports study, removed just one of the Rhox genes—Rhox10 – and found essentially the same defect as deleting the full set. Wilkinson, Song and team discovered there was nothing wrong with the spermatogonial stem cells in mice lacking Rhox10, only that there were so few. They found that this occurred because most of the earlier stage cells—pro-spermatogonia—did not specialize into spermatogonial stem cells. As a result, the testes of Rhox10-deficient mice did not enlarge and their sperm counts failed to increase as they aged. The Rhox genes are on the X chromosome. It makes sense that male infertility would be caused by mutated genes on the X chromosome, Wilkinson said, because men only have one copy—if something goes wrong with an X-linked gene, they don't have a backup, like women do. "Spermatogonial stem cells allow men—even in their 70s—to generate sperm and father children," said Song, who also co-authored the Human Molecular Genetics study. "Our finding that Rhox10 is critical for spermatogonial stem cells, coupled with the finding that human RHOX genes are mutated in infertile men, suggests that mutations in these genes cause human male infertility." Co-authors of the Cell Reports paper also include Anilkumar Bettegowda, Blue B. Lake, Adrienne H. Zhao, David Skarbrevik, Eric Babajanian, Eleen Y. Shum, Mimi H. Phan, Terra-Dawn M. Plank, Marcy E. Richardson, Madhuvanthi Ramaiah, Vaishnavi Sridhar, Kun Zhang, UC San Diego; Meena Sukhwani, Kyle E. Orwig, University of Pittsburgh; and Dirk G. de Rooij, Utrecht University.